AimprosoftBlogAlfresco InsightsHow to organize a banking document management system with Alfresco? The last few years have been pivotal for the banking industry. Traditional banks are turning into modern, strategically focused agile institutions. The diverse challenges – ever-changing complex regulations, intense competition, and demanding customers to name a few – slow down a shift towards transformation. Document management solutions become vital for the banking industry. They can unleash the infinite potential of digital technologies for providing excellent client services. Let’s have a look at points of making a bank document management system that will allow your bank to achieve higher customer centricity. Though the banks have tried to reduce paper usage in recent years, the managing paper-based documentation stays a major challenge for them. Besides, not all banks which automated document management can boast that their software satisfies the latest requirements. There is a range of hindrances with a bank document management system we are going now to shed light on. The global banking industry has the most rigid rules as for the retention and destruction of the papers created in banks or received by their employees. These requirements should be continuously updated and revised following legislative changes. AccuSystems surveyed community banks with combined assets over $30 billion. 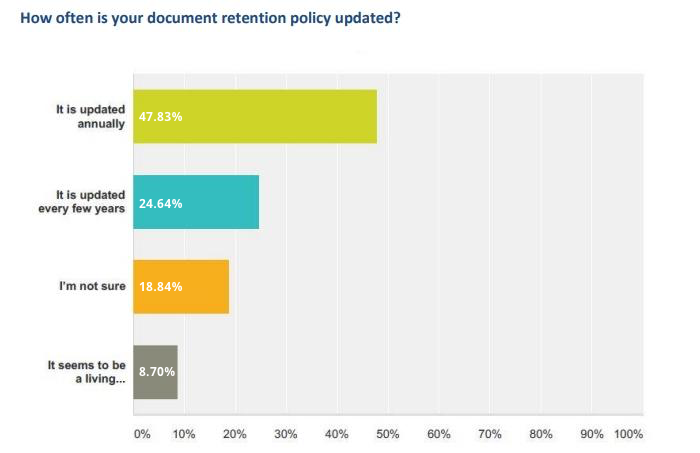 All have a serious attitude towards document retention policy. Almost half of them updates the current regulations at least once a year. Storing separate paper documents is a problem of continuing concern. The papers can be ruined, mixed up, or lost. At the same time, the cost of non-compliance is exceptionally high. The bank may be subject to regulatory action or monetary damages. In spite of the document management system software potential, some banks are reluctant to execute a transformation journey. Why is it so? The thing is that clients of banks trust paper more than computers. According to Credit Cards, 54% of adults receive paper-based credit card or checking account statements by mail. They say they prefer keeping paper statements for their records. Some of them admit that they have got used to paper. One way or another, their loyalty to paper remains very strong. Certain records must be stored in both digital and hard-copy form. These documents include negotiable instruments and other original documents required for proving ownership or transfer title. The above facts suppose digitizing the high volume of paperwork to streamline the workflow and banking operations. Bank employees come across inconsistencies in parameters of the same documents time after time while processing a business transaction. The document descriptions and metadata differ significantly depending on the department. As a result, searching and retrieving the particular file takes too much time. These delays irritate clients who have to fill in the same forms countless times or wait a long while for the inquiry to be handled. It’s annoying that the wrong choice of bank document management systems can cause such unpleasant situations. It’s worth noting to pay attention to the software with a thorough code system and a full-text search. Earlier document management systems for financial services that found favor with banks in the 1980s became unfit now and here is why. For starters, legacy mainframe systems cannot protect against cyber attacks. The growing number of data breaches forces system administrators in banks to monitor new threats and patches. There is no way of getting updates from its vendor nearly. Then, a worrying reduction in staff productivity is reflected when working with slow software that lacks integration with other banking apps internally. Lastly, the outdated software harms the bank-customer relationship. Today’s clients actively use advanced technologies both in business and in private life. They want to get an instant result and will be disappointed by the long answer. Bank staff processes bulks of papers on a daily basis. Clerical errors become a commonplace. They can cause losses for both a client and a bank. Everybody remembers a sensational story in Ireland last spring when one human error resulted in that money has gone from some of the customers’ bank accounts. Banks are eager to reduce the number of errors caused by human factor. The DMS which eliminates the number of manual operations moves banks a step closer to a paperless office and transforms a document management workflow into effective. We have already considered bottlenecks and gaps occurred in document management for banks. Now let’s discover more pleasant things as the main benefits you can get from a DMS. Image 2. Benefits of a document management system for the banking industry. Clients hate waiting. They want to get their inquiry resolved here and now. Document management solutions for banks meet the customers’ wishes and allow handling any request in the fastest way possible. Supposing a potential client wants to open a bank account. An account representative finds the information about different account types and banking offerings in a few seconds with a DMS. A client gets a detailed answer to his questions and becomes a bank customer. Banking regulations change so fast that banks hardly manage to keep up with the latest updates. Punitive measures in case of non-compliance will come into effect without delay. Document management software can save the day. Secure and auditable data capture ensures compliance with the key regulations such as global Payment Card Industry Standard, Financial Conduct Authority (UK), the regulations of the Consumer Protection Bureau (USA) or the European Banking Authority. Keeping and managing endless hard copies of client applications, financial statements, credit reports, and loan agreements can cost a bundle. Banks rely on document management software to avoid unnecessary paper-based and printing costs. Another financial benefit for banks comes from the reduced time of each transaction. Finally, there is no forced downtime happens with a DMS system while searching for the required documents. The financial statements, signature cards, and enrollment forms will always be at hand. In today’s fast-paced working environment low staff productivity causes serious concerns. Simultaneous collaborative work on content thanks to DMS systems improves your team work rate. Electronic document management enables banks to distribute specific responsibilities among people in charge. The employees receive their tasks, get the instant access to the files, and immediately take up their duties. This approach clearly strengthens the teamwork. Internal and external audits are mandatory procedures for banks. Their goal is to keep up the financial reporting, correspondence, financial statements, internal document requests, and other vital documentation and stay compliant with the current laws and regulations. The right document management software makes this process fast and easy. All document management systems are remarkable of some features. They may have a completely different set of tools. The choice of essential features for your bank requires serious consideration. As a result, you will get a perfect DMS that will turn your organization into the bank of the future. When you are going to cook a dish, you initially select the ingredients you will need. Then you add them for creating a culinary masterpiece. The same goes for a DMS. You take the required components and get the advanced system that will be a silver bullet for your bank. These essential components are as follows. Advanced search. The digitalization of paper-based documents loses sense when it is still difficult to find a particular file. Banks can reduce the time for document retrieval making their text searchable either by full-text search or by specific criteria. Scanning and imaging. The document management software should be compatible with desktop scanners. Then any enrollment form or client application can be uploaded straight to the DMS with the help of a browser. The role-based system of permissions. The larger bank, the harder it gets to define the employees with access to sensitive information, e.g., digital signatures, credit card numbers, transactions. A system of permissions is the best way to protect vital files from changing or accidental deleting and streamline the work with them. Mobile compatibility. To achieve fruitful collaboration can help remote access to client applications, loan agreement or other files from any mobile device. Therefore, the importance of mobile compatibility should not be ignored. Updates. Bank employees should be informed about changes in a particular file or workflow timely. A good notification system allows sending direct messages to users or groups with the latest updates. Intuitive user interface. Management software should be relatively simple and understandable so that the staff could use it right after installing. The drag-and-drop capabilities and attractive design are welcomed here to get involved people. Version control. Overwriting the latest version of the document with a previous one can create chaos at the workplace. With a version control feature, changes and final file versions will be under control without data loss. Cloud access. Uploading and downloading files anytime anywhere has become commonplace for many industries. Active usage of cloud computing for storing files related to human resources, customer analytics, and customer relationship management is a norm for advanced banks. Audit trails. Audit trails allow getting a broad picture of records documenting steps of business transactions. They prove the validity of financial information of any kind and is a complete report on a document in question. Task manager. The staff should know exactly what to do with each accessible file. Task manager simplifies creating and scheduling repetitive administrative tasks, e.g., content maintenance and document processing. the higher performance of the team follows. Reports. A good document management software should offer diverse reporting options. The reports should be classified by document type, category, loan type. A centralized system of exception reporting reduces the number of oversights. The recent Forrester report named Alfresco a leader in the Forrester Wave: ECM Business Content Services. Open architecture, active user community allowed the platform to get on top. However, the strengthens of Alfresco DMS does not end there. Let’s find out what other benefits the platform can offer to the banking sector. The interaction with clients starts with onboarding. Without a proven document management system, it becomes tedious and laborious. Take as an example opening of deposit account for a new client. The account manager gathers tons of documents, e.g., names, social security numbers, utility bills, residential address. These documents verification may take days. Alfresco Document Management System directs scanned versions of the documents straight to the repository where they are kept in perfect order. This approach helps clients to avoid repeated form-filling. In spite of the growing popularity of cloud solutions, some banks tend to opt for an on-premise deployment model. Easy modification and customization in accordance with the specific needs of a financial institution are the key factors there. Alfresco on-premises solutions give banks more control over critical data. Besides, banks can choose information protection facilities by themselves. This possibility becomes crucial because of increased incidence of cyber attacks. Other benefits include independence of internet connection and control over the server hardware. Customer communication is not limited to the issuing statements and sending updated policies and new bank offerings to the existing clients. Self-service solutions help both clients and employee save their precious time. Having the login and password, the customers can view critical information related to their accounts when it suits them. The system allows tracking customer interactions with the bank. When employees see the history of transactions, they better understand customers’ needs and provide better customer service. Every customer request is expected to be serviced efficiently and accurately regardless of its complexity. Otherwise, the growing amount of dissatisfied customers can damage the bank’s credibility. With Alfresco development solutions, the client service in banks performs more effectively of the hour. The most exacting customers can get the full insight about their transactions and account status on remote due to complete automation of document management and business processes. Banking analysts can easily advance workflows and shorten response time to improve customer loyalty. Here is a full list of Alfresco development solutions to boost your business. As the banks continue growing, their requirements and needs are changing as well. Therefore, a strong document management system should keep up with these continually evolving needs. Enhanced integration capabilities and modular architecture which ensures superb scalability make Alfresco platform the suitable option for the banking sector. You will be surprised at how significantly software maintenance costs will be reduced due to the easy configuration of features. Time is money. This old proverb is especially close to bankers. There is an excellent diversity of bank document management systems available in the market. 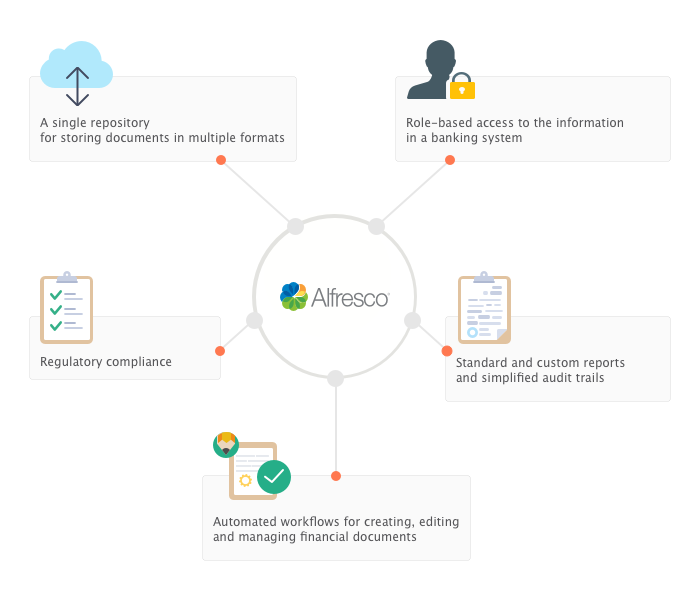 More and more banks tend to use Alfresco DMS as an appropriate solution for accelerating document management and business processes. With its open architecture and the high degree of scalability, it helps to create the bank of the future and derive maximum benefit from adopting cutting-edge technologies. To join a community of prosperous banks, feel free to contact us to know more about software solutions.